Design thinking has created value that has enabled the design discipline to have a greater voice at the table of enterprise digital strategy. At bare minimum, software applications are designed to be usable and useful. For example, organizations truly benefit from digital products that tolerate user mistakes and from which users can learn the system at a fraction of the time and training cost. Processes are leaner and costs are lower. However, thanks to design thinking, great design has that “wow” factor that makes products more desirable and services more appealing to users. Not only do these products meet the bare minimum usability requirements, they also create brand advocates. Following is what I recently learned from one of our Product Designers about design that takes products from usable, to useful, to desirable—and finally—to delightful. What is delight in product design? To be pleased is (at least) to represent a net increase in desire satisfaction relative to expectation; to be displeased is to represent a net decrease in desire satisfaction relative to expectation. Intensity of pleasure or displeasure represents degrees of change in desire satisfaction relative to expectations. Research shows that pleasure is linked to dopamine being released in the brain, which brings on habit formation as a desirable side-effect. This is useful as we shape user habits to improve productivity. If we translate this to digital experiences, delight could be represented by applications that go the extra mile and make our lives easier and better, above and beyond our expectations. Need to log in, but don’t feel like entering your password? Slack sends you a magic link that automatically opens the app and authenticates you. Is the application taking longer than usual to load? Slack displays clever and humorous messages to keep the user entertained. These two features are just a few of many micro-interactions in the application that are unnecessary and unexpected, yet helpful—and thus delightful. As users, we have been scorned by bad software. Raising the bar, it seems, is easy for folks at Slack who have delight baked into their design culture. Before we can invest in and quantify return on delight, let’s take a look at a hierarchy of needs based on product experience. Similar to Maslow's hierarchy of needs model, which poses that people won’t focus on self-actualization if they’re starving or don’t have shelter, delight is a progression. Most users won’t be delighted until other needs have been met, as shown in the following product experience pyramid. The first tier is usable. For example, a usable car door is one that opens and allows a passenger to get into the car. It may not be the most comfortable door and you may have to contort yourself while entering the vehicle, but it works. While it may seem a low bar, the majority of enterprise software (especially off-the-shelf ERP platforms) are one-size-fits-all Frankensteins that sacrifice usability over reusability. I once heard an incredible quote in a meeting with a manufacturing client: “It takes a new hire an average of 1.5 years to properly learn our ERP.” How can an organization like that react to shifting market needs or customer demands? And while these off-the-shelf workflow products do provide flexibility for customization, they are akin to a car door that requires you to enter through a cracked window. A mobile banking application allows a customer to deposit checks without visiting a branch, saving precious time. A field service application helps technicians shorten the work-order cycle and collect payment the same day as service has been performed. The trunk of any modern vehicle can be opened by pushing a button on the remote, freeing up your hands for precious mall loot or that delightful Mocha Frappuccino. Desirable products are products that rise above and beyond similar products in the competitive landscape. A combination of features, aesthetics, usability, and usefulness elevate the product to a greater market-share position. Sonos comes to mind as a brand that has created a desired product in the home electronics market by combining elegant hardware design with flawless software integration. Be it through their mobile applications or other integrated apps (such as Spotify), playing music to a Sonos device requires, literally, a single tap. Delightful products share traits of all of the above and manage to affect us on the emotional level. Be it through repeated dopamine conditioning or through pure aesthetic attention to detail and elegant design, delightful products continue to surprise us the more we use them. The doors of Tesla’s Model X automatically extend their handles as you approach the vehicle. Furthermore, the falcon wing doors extend upward only as far as sensors will allow, based on available headspace—no chance of scratching them against an overhanging pipe or low ceiling. Apple’s latest operating system automatically identifies when you park your car and marks the cars location on the map. Delightful products manifest themselves by continually delivering a net increase in desire satisfaction relative to expectation. Customers conditioned by delightful products and their continuous dopamine feed tend to be vocal brand advocates that will sacrifice features over design. Let me repeat that: A delightful mobile banking application with fewer features will win over a feature-rich, yet poorly designed experience any day. Moving your digital product up the pyramid requires investment. Similar to Maslow’s hierarchy of needs, you can’t invest in delight if your application has random errors and an unresponsive experience. How do we determine the amount of investment necessary, as well as the return on said investment, when constrained with the classical scope, cost, and schedule iron triangle? To be the devil’s advocate, not all products need to reach the elite levels of delight, as the return simply may not be worth the investment. Take, for example, a piece of software that operates elevators in a high-rise building. By making an investment, the manufacturer could allow for the floor selection interface to take verbal commands. Leaving accessibility benefits aside for now, such a feature provides only marginal benefit in its user’s quality of life (unless they’re germaphobes). It doesn’t get users to their destination any faster. Furthermore, the user doesn’t necessarily have an alternative choice, unless they want to huff and puff their way up to the desired floor. It’s safe to say that an elevator system warrants an investment to be useful, but not necessarily delightful. So how should product managers determine the investment strategy? Ship it early, but devoid of any delight, or invest more, take longer and delight users along the way? It depends. Our recommendation is to look at the product hierarchy of needs and establish metrics against each tier, measuring the product against the market or itself. 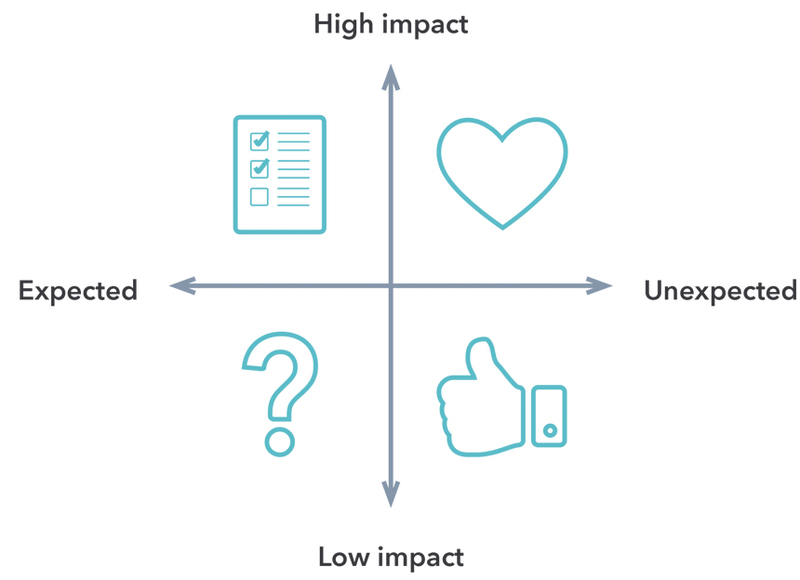 While there can be a debate on what a “must-have” feature is, this matrix really simplifies the decision-making process for a product launch or ongoing product development. In the real world, we have found that the enterprise is often faced with an initial must-have list that is excessively large. Furthermore, very little thinking is done around items that are both high impact and unexpected by their customers (be it internal or external). Clearly there’s an opportunity to delight. Lastly, an investment strategy is only as good as the metrics used. Our recommendation is to evaluate the product through two different paradigms: the business metrics, such as number of subscribers and successful conversions; and the empathy and emotional response that can be captured through NPS surveys of customers. Most decisions made for the benefit of the customer will positively impact the business KPIs, while the reverse is not necessarily true. Tidal, a new, ultra-high quality music streaming service, does not allow a user to preview the experience without first entering a credit card number and subscribing to a trial. Great decision by someone from the business side— some users will forget to cancel the $15 monthly fee, likely having a positive impact on revenue collected. As a customer, however, I wasn’t willing to make such a commitment because the practice simply feels cheap and misleading. To summarize, delight leads to loyal customers and word-of-mouth brand ambassadors. It requires a smart investment and strategic prioritization to capture the ROI through a set of business and empathy metrics. Not all products must necessarily delight, yet all should be usable and useful. Looking for more information on designing delight into digital products? Watch the video below.